Hard to believe we have already arrived at the midway point for regular season high school football in Utah. Things are starting to take shape as teams get into region play, and that always makes the games just a little more intense. As we look at the players who stepped up on Thursday and Friday nights (and in the Saturday afternoon contest), here are some of the notable performances. Let us know about the big plays and players we did not get on our list…. 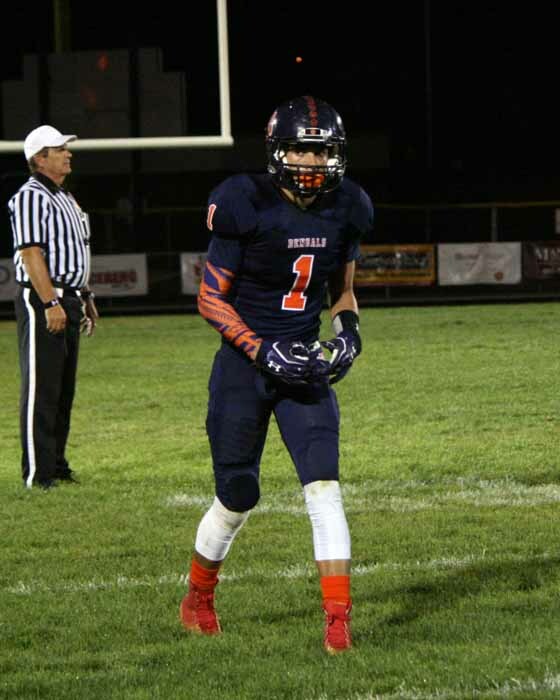 Joshua Davis continues to put up huge numbers for the Alta (3-2, 1-1 Region 7) offense. The junior had 25 carries for 372 yards and three touchdowns (including two TD runs of 75 yards and another from 55 yards out) as the Hawks knocked off Orem 61-35. Davis also caught two passes for 67 yards, with a 57-yard scoring reception. The Alta defense also had a number of big plays Friday night, led by junior Davian Leota-Hunkin (four sacks), junior Mata Hola (three sacks) and sophomore London Rockwood (three interceptions, including a 25-yard pick-six). Jordan Hardy turned in one of the biggest running performances of the season (or any season) in leading Milford (4-1) to a 56-28 win over Parowan in a 1A South Region opener. 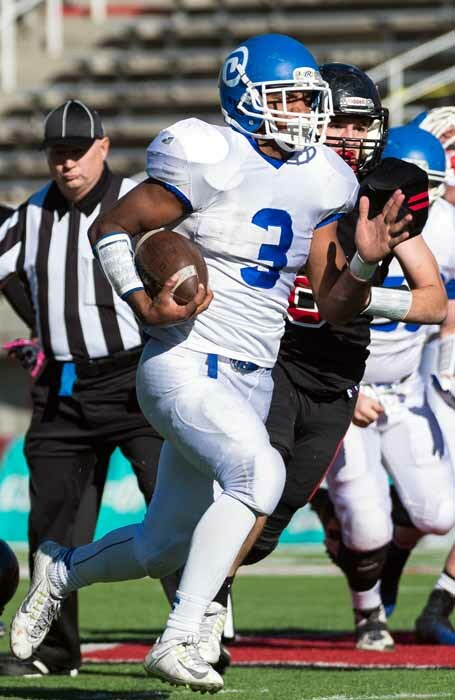 The junior running back carried 29 times for 314 yards and SEVEN touchdowns. 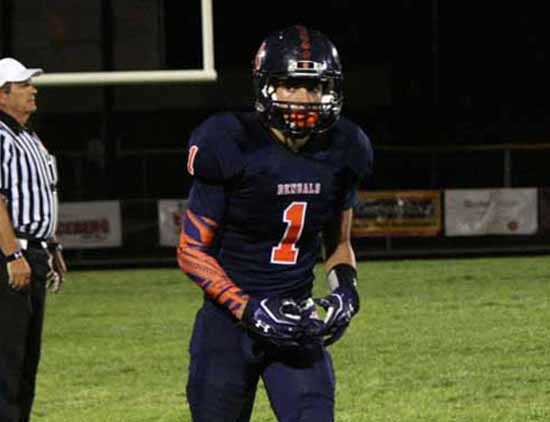 Another of the night’s biggest performers was Brighton (5-0, 2-0 Region 3) receiver Simi Fehoko, who caught a 90-yard touchdown pass as part of an eight catch, 252-yard, three TD game in the Bengals 49-30 victory over Taylorsville. Hunter Albert threw for 320 yards and four scores for Brighton, which also got 14 carries for 155 yards and three touchdowns from Sione Lund. Lund also had 16 tackles for the Bengal defense, which also received 19 tackles from Max Hoole and 16 from Jackson Kaufusi. Quarterback Dane Leituala had a big night for Taylorsville in the defeat, as he carried 28 times for 296 yards and a pair of scores. Vili Wolfgram (four carries, 79 yards, touchdown runs of 60 and 2 yards; 13 tackles and a tackle-for-loss; two interceptions (both returned for scores from 20 and 35 yards) led Salem Hills in its 34-17 victory over Uintah. Defense was the story for Springville (5-0, 2-0 Region 8) as the Red Devils beat Spanish Fork 16-14 behind eight sacks (three from Junior Mulipola, three from Vili Kolomalu and two by Adam Rodriguez). Senior Payton Higgins was a big performer for Canyon View (4-1, 1-0 3A South) in its 55-28 win over Manti. Higgins had a 65-yard scoring run as part of a great day on the ground, as he carried 11 times for 209 yards and two touchdowns. Spencer Applegarth scored five touchdowns for North Sanpete (3-2, 1-0 3A South) as it outscored Delta 70-36. Applegarth finished with 16 rushes for 214 yards, with scoring runs of 71 and 80 yards. The senior also had six catches for 97 yards and three TDs, including scoring receptions of 25 and 43 yards. The highlight non-region performance came from Bonneville senior Kobe Beatty, who ran it for 224 yards and four scores on just 13 carries in the Lakers’ 48-7 win over Ogden. Senior Tre Miller ran 22 times for 152 yards a pair of touchdowns, and Jeff Martinez led the Dixie (4-1, 1-0 3AA South) defense with 11 tackles including three tackles-for-loss as the Flyers took care of Cedar 47-19. Bingham (4-1, 2-0 Region 3) is hitting its stride as its most difficult league tests draw closer. A pair of long Kyle Mitchell field goals (41 and 50 yards) combined with two long returns – an 85-yard touchdown on the opening kickoff by Daniel Loua and a 99-yard pick-six by Simote Lokotui were all part of a 64-0 Miner win over Copper Hills. 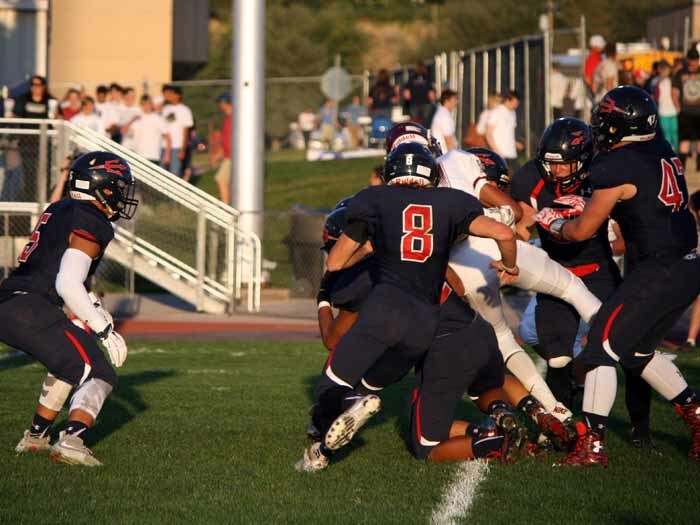 Herriman (3-2, 1-0 Region 4) scored all 28 of its points after halftime as the Mustangs beat Westlake 28-3 as Leki Fotu had nine tackles (3 TFL), 2.5 sacks and four quarterback hurries. In a battle that was largely decided on the defensive side of the ball, Summit Academy (3-2) got 10 catches for 125 yards and a touchdown from Kholten Bills as it improved to 1-0 in 2A North play with a 16-7 victory over Millard. South Summit’s Isaac Tillett ran for 118 yards and a pair of scores, and also took a punt to the house from 65 yards out as the Wildcats (5-0) won their 2A North opener against American Leadership Academy 52-9. Northridge (3-2) opened Region 1 play with a 42-32 win over Weber as senior Cyrus Daniels ran it 24 times for 215 yards and two touchdowns. Sky View (5-0, 2-0 Region 1) stayed unbeaten as Garrison Beach was 18-of-24 for 240 yards and three scores in the Bobcats’ 35-0 win over Clearfield. Now in Region 2, Davis (5-0, 2-0) is also still undefeated following its 41-17 victory over West. Senior Griffin Hill had 203 all-purpose yards, and scored from 63 yards on a reception and 95 yards on a kick return for the Darts. Davis senior Connor Taylor has 12 tackles, including 1.5 tackles-for-loss. Kearns improved to 5-0 overall (1-0 Region 6) with its 41-14 win over Hillcrest. Graden Luckhart caught a pair of passes for 59 yards and a 35-yard touchdown on offense, and led the Cougar defense, which had eight sacks, with 15 tackles. Shay Reid had three receptions for 115 yards and two touchdowns. Another 5-0 team is Lone Peak (2-0 Region 4) as the Knights got a big night on the outside from Tyson Doman (5 catches, 111 yards, two TDs) in a 44-15 victory over Riverton. Timpview (4-1, 2-0 Region 7) spread the load around during its 42-7 win over Provo. Nate Richardson had 11 tackles to pace the Thunderbird defense, while Samson Nacua caught seven balls for 131 yards and a touchdown, and also scored on a 99-yard kick return. Pleasant Grove (2-3, 1-1 Region 4) got its offense going in its 35-14 win over Lehi, as Koy Wilkinson ran it 20 times for 170 yards and a touchdown. The senior running back also caught a 33-yard touchdown pass from Isaac Hamilton, who was 19-of-30 for 264 yards and four scores. The ultimate defensive struggle of the night was played at Snow Canyon, where the game was scoreless through regulation and two overtimes before the Warriors scored on their possession of the third OT period. Pine View (4-0, 1-0 3AA South) answered with a Riley Livingston to Steve Bangerter 20-yard TD pass, and when the two connected on a two-point conversion, the Panthers got the 8-6 win. Junior Dillon Robertson (10 tackles, 1 TFL, fumble recovery) and senior Kyle Tauiliili (8 tackles, sack) paced the Pine View defense. It was another big night for Park City’s Zur brothers, as Spencer Zur was 21-of-31 for 357 yards and three touchdowns, with six of those connections coming to Collin Zur for 116 yards and one of those TDs, in the Miners’ (3-2, 1-1 3AA North) 28-6 win over Bear River. Third-quarter passes of 61 and 30 yards from Alex Hoffman to Josh Vasquez helped Juan Diego (4-1, 1-0 in 3A North) separate itself from Morgan after the teams were tied at intermission. Hoffman tossed three touchdown passes and ran for another score as the Soaring Eagle went on to the 35-21 win. 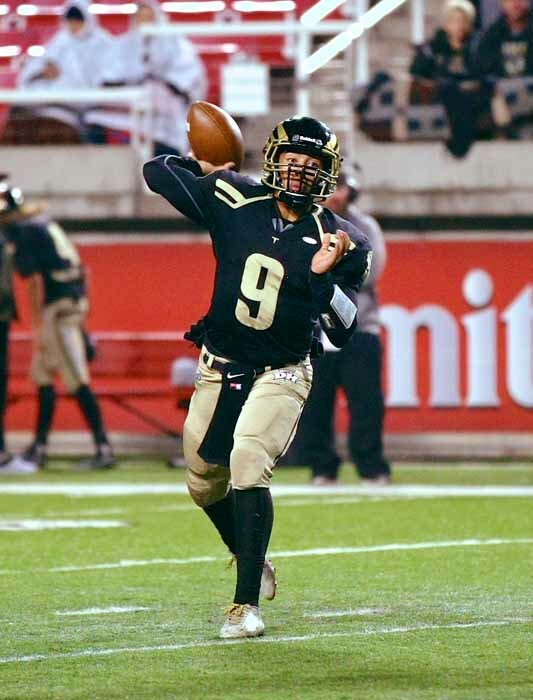 Desert Hills (2-2, 1-0 3AA South) got off to a good start in 3AA South play with a 37-10 team over Hurricane, avenging its state semifinal loss to the Tigers from last season. The Thunder were led by senior quarterback Nick Warmsley, who was 17-of-25 for 238 yards and three scores. He also ran it a dozen times for 67 yards and a touchdown. Beaver (4-1) won its 2A South opener over Enterprise 35-13 as junior Dillon Smith carried 20 times for 143 yards and touchdown, while catching three balls for 131 yards, including an 85-yard TD reception. Logan (3-2. 2-0 3AA North) took care of Ben Lomond 49-21 behind four touchdown passes (13, 22, 38 and 40 yards) from Robbie Ballam. Grand County (3-2) senior Dalton McElhaney carried 12 times for 157 yards and four touchdowns in a 62-0 victory over North Sevier in the two teams’ 2A South opening game. Four rushing touchdowns by Austin Allred led Emery (3-2, 1-0 in 3A North) to its 41-7 win over Carbon. Senior Korbyn Bertoch had 13 tackles, two of them tackles-for-loss, as Union (3-2, 1-0 in 3A North) knocked off Grantsville 34-16. Senior quarterback Vil Lutui led the Cougar offense with 285 yards and two TDs passing, and 62 yards with a pair of scores running the ball. Stansbury (4-1, 1-1 3AA North) got back on the winning track 27-13 over Judge Memorial, as senior Brennen Calder led the defense with eight tackles, including four tackles-for-loss. Calder also had four quarterback sacks. Senior Nate Hale recorded 13 tackles, including four tackles-for-loss, a sack and an interception, as Olympus (3-2, 1-0 Region 6) beat Cyprus 43-0. Timpanogos (1-4, 1-0 Region 7) picked up its first victory of the year against winless Mountain View, as Jaxson Smith ran for two touchdowns and passed for two more in the Timberwolves’ 40-21 win. American Fork (3-2, 1-0 Region 8) won a hard-fought 10-7 non-region battle with Corner Canyon as senior Joshua Bailey had 11 tackles. Jordan (4-1, 1-0 Region 4) came up three points short in its comeback attempt against Colorado’s top team, Cherry Creek, Saturday. The Beetdiggers scored 21 points in the fourth period, but lost 38-35 despite 482 passing yards and four TD passes from Drew Lisk, and six catches for 173 yards and two scores from Isaiah Jackson.